Hello all. Today I will give an overview of Hutsul Costume. 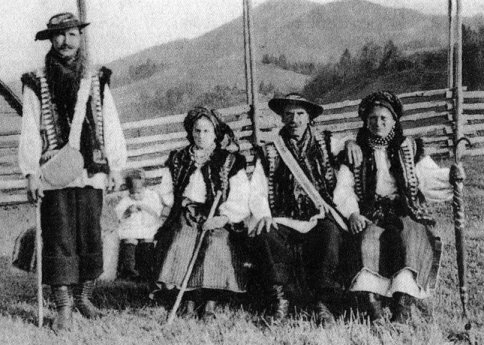 The Hutsuls are a Ukrainian tribe who live in the Carpathian mountains at the point where they bend from extending east to extending south. south of the town of Nadvirna, the western end of the Cherniwtsi oblast, west and south of the town of Vyzhnytsia, and a small adjoining area of Romania. Despite how this may sound, this is a compact area that forms only one region. This is not uncommon for mountain people, as flatlanders tend to draw the borders, and they seem to think that along a mountain ridge is a good place for a border. 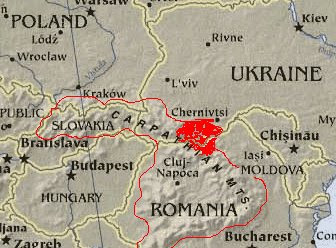 The three oblasts mentioned maintain the historic division of Ukrainian territory between Hungary, Poland, and Moldavia, respectively. This is, very roughly, the Hutsul region. I have a much more detailed map, but i have not been able to figure out how to color it to make the different regions visible. I can email it if someone is interested. And here are a couple of photographs taken by Oleksander Pezhanskyj. The basic item of the woman's costume, is [of course] the chemise. In Ukrainian it is called the sorochka. The front and back of the chemise were made of separate pieces. 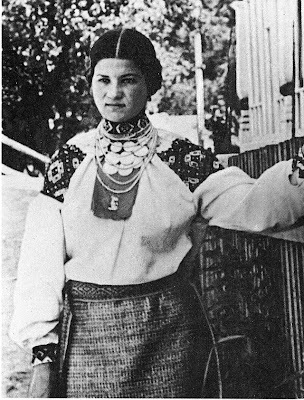 There were shoulder insets, called ustawky, which were sewn to the sides of the chemise, rather than on top, as is more usual in Ukrainian costumes. The four pieces were gathered into the neckband. The Lower sleeve was sewn perpendicular to the body of the chemise and to the ustawka. Both the body and the sleeves were less full than in other parts of Ukraine, as well as being made of heavier linen. Here is another photograph that shows the cut of the chemise. As you can see, the shoulder piece is embroidered in a wide band along the lower edge, next to the seam. The lower sleeve is often slightly gathered, with a unique technique that gives the gathering a specific texture. 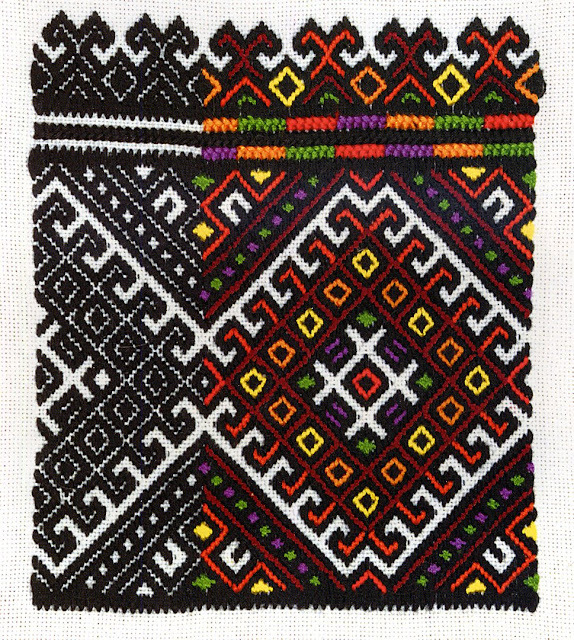 The embroidery in most villages was of the technique known as nyzynka. 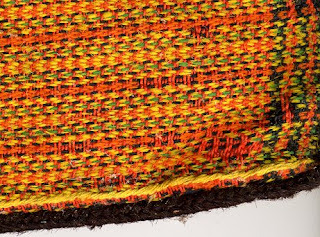 This is basically a darning stitch, which is found from Norway to Southwest China. What is very unusual about the Hutsul version is that most people stop when the design is finished, like this. This could be the design on a woman's collar in Voss in Norway. but continue by filling in the fields with various colors, like this. Both of these examples were executed by the artist Evdokia Sorokhaniuk. This one is done in a warm color scheme, which is often considered typical for Hutsul costume, but they are also done in a cool color scheme like this example from my private collection. You can see the seam where the ustawka, or inset was sewn to the body of the chemise, and in the center, you can see the seam where the lower sleeve was sewn to both. In this case, the lower border was embroidered on the sleeve. The seam itself is covered with a wide black line in the embroidery. The neckband and wristbands are also embroidered, the lower hem, unusually for Ukrainian costume is typically not embroidered. I will further explore Hutsul embroidery in future postings. If you take a quick peek at the photos above, you can see how the embroidery falls on the arm. 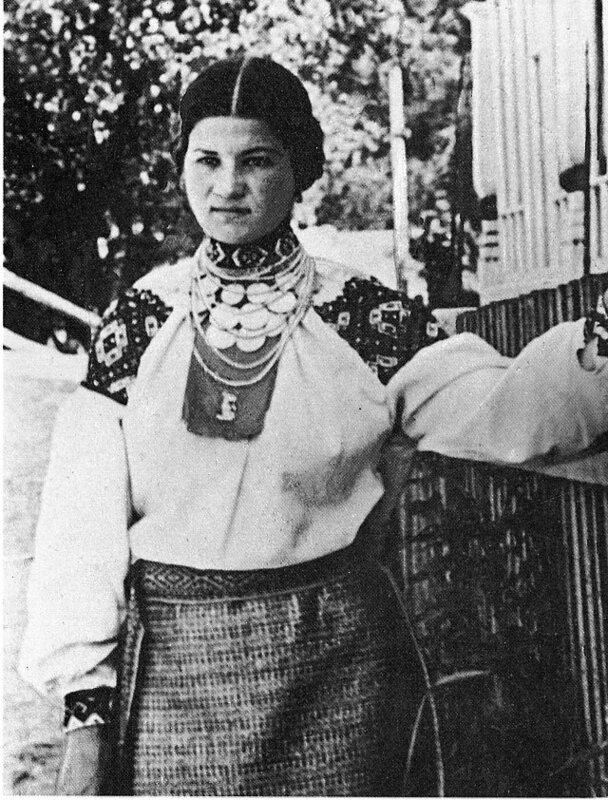 You will also see the distinctive feature of the Hutsul woman's costume, the double apron. 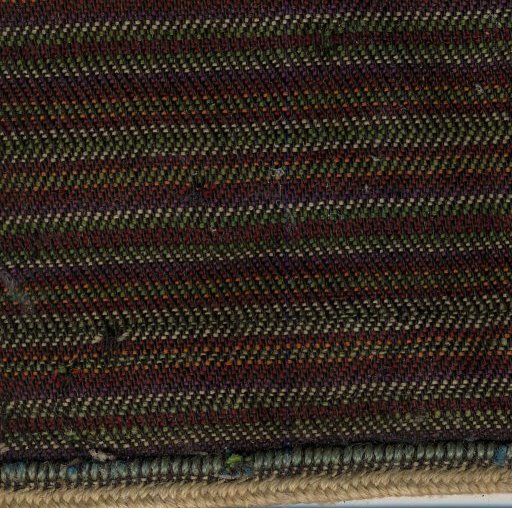 These are two separate rectangular pieces of cloth, woven with fine stripes and bordered in a wool braid, that are tied on by strings attached to the upper corners. The back one is put on first, and then the front one. Then a colorful woven sash is wrapped around the waist. 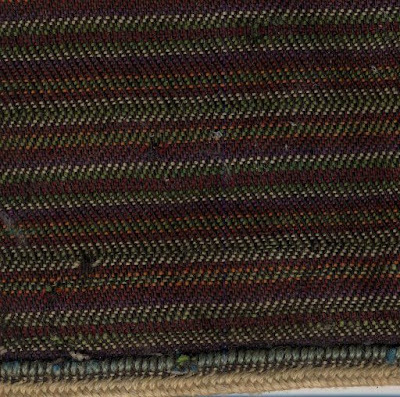 Here is a closeup of the weave of one of these aprons. The braid that edges the piece is visible at the bottom. The color of the aprons varies from village to village, from dark like this example to golden yellow/orange in the town of Kosmach, as in the example shown below. One of my readers pointed out that there are no actual orange threads used, but rather a combination of red and yellow, along with other colors, but the overall effect is a golden/orangy color. 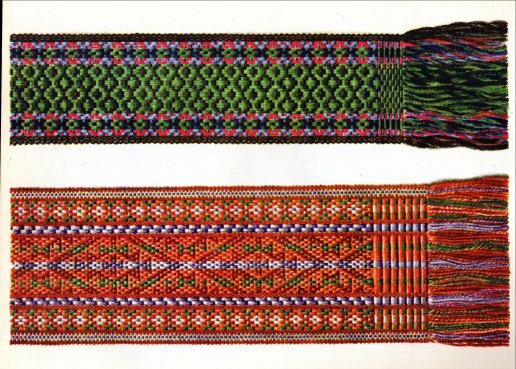 ﻿Here are a couple examples of Hutsul woven sashes, which are called kraika. 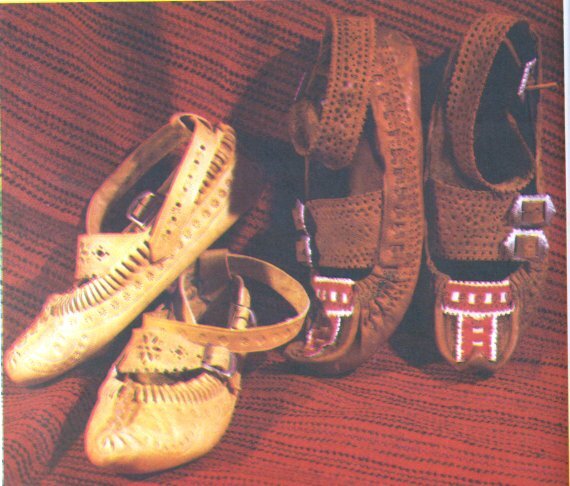 Here is a closeup of footwear from a display in the Museum of The Folk Art of the Hutsul Region in the city of Kolomyja. 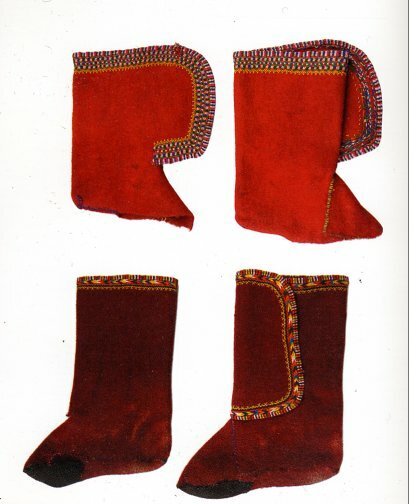 These footcloths are called kapchuri, they are cut and sewn from a very heavy and stiff woven wool cloth. This same cloth is used for outerwear. Knitting is not a craft which forms part of Ukrainian tradition. Today you will find Hutsuls using knit socks, but this is a recent development. [As an aside, the famous artist Jan Brett illustrated a children's book depicting the Ukrainian Folk Tale 'The Mitten'. She made the mitten knitted, one of many inaccuracies in her drawings. I really wish she had done more research, Much of what she drew in that book is Scandinavian instead of Ukrainian. Just petting one of my peeves here.] There is a part sewn to fit the foot, and another piece sewn on to form the leg of the sock, the edge of which is embroidered. 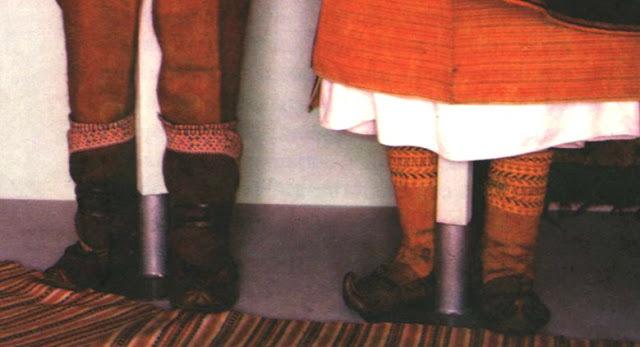 The top is wrapped around the lower leg, and held in place by straps attached to the footwear, a type of moccasin which are called Postoly. Here are some closeups of kapchuri and postoly. Kyptar and Serdak, and headgear. Here is a photo of the man's costume from the town of Kosmach. Embroidered shirt, worn outside the pants, sash or wide leather belt, called the cheres, linen or woolen, according to season, pants tucked into the kapchuri, the embroidery down the side of the pants is most unusual and one of the distinct characteristics of this town. Postoly on the feet. a heavily decorated round black felt hat on the head, walking stick in the shape of a little axe, called the topirets. Sheepskin vest, called the Kyptar or Keptar. I hope that i have impressed you with the beauty and creativity of ordinary people, and maybe inspired you to make something beautiful to use in your life. Hi Roman! I was very excited to find this article. I'm trying to help my aunt identify some of her costumes in her collection. It's about 95% Hungarian, but there are quite a few unknowns. 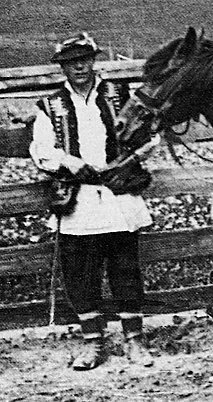 We had suspected some of it was Hutsul, and from looking at these pictures, they probably are. Would you be interested in looking at some pictures for us to help with an ID? Email me at andi.speck@yahoo.com. That whole business about your "pet peeve" regarding Jan Brett's illustrations really takes the cake. 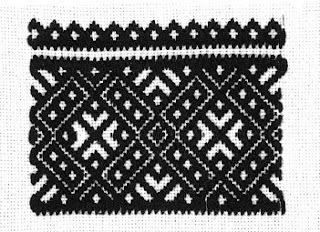 If you would have bothered to look at least a little deeper into the subject matter (i.e., "knitting" and its place in the Ukrainian tradition), you would have found that all of the Ukrainian territories under Austria-Hungary (predominately Halychyna/Galicia, Bukovyna, and Zakarpattia) had been systematically introduced to knitting (called "trykotazh"/"trykotars'ki vyroby" in the Ukrainian language of that era, and more often called "v'iazannia"/"pletinnia" in today's modern Ukrianian usage) from the West all through the period these lands were under the Aust.-Hung. Crown, and then afterward during the inter-war period. 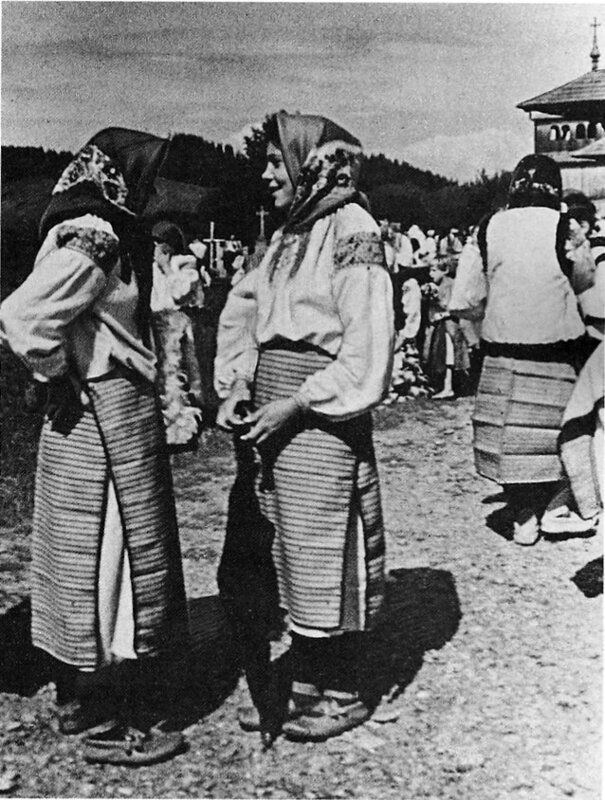 Almost every village had women's groups that participated in specially organized workshops, classes, and seminars, (often in "chytal'ni"/"reading rooms" of the local branch of the "Prosvita"/"enlightenment" movement, by the priest's wife, or by activists who traveled from village to village from the larger cities of L'viv, Ternopil', Stanyslaviv, Chernivtsi, etc.) that taught the women such everyday practical skills as knitting, tailoring, food preservation/canning, modern methods for looking after a family's hygiene, etc. Just look at almost any book dedicated to the history of this or that region and you will inevitably see archival photos of these groups of girls and women, taken by professional photographers, to commemorate their having taken part in this or that "kurs", with "trykotarstvo"/"kurs trykotazhu" (= "knitting") being one of the more popular of these. Indeed, many Ukrainian village women knew how to knit at the end of the 19th c. into the 20th c. And, besides, even though it isn't exactly "knitting", the traditional folk method for making mittens throughout all of Western Ukraine (and beyond) was a type of knotted weaving that was done over a series of warp threads strung across two special wooden forms/"stanky", one that produced the "thumb" of a mitten, and the other that produced the body of the mitten to which the thumb was then joined to form a seamless whole, and is a technique that may not be "knitting" per se, but, if referred to as "knitting" as a device in the spirit of "literary license" when retelling and illustrating such a traditional tale as is "Rukavychka", IMHO, is absolutely acceptable. And besides... Every other detail of the illustrations is absolutely ethnographically correct as rendered regarding color, motifs, styles, etc, to the point that a person who is more than just superficially acquanted with traditional Ukrainian regional folk apparel is able to recognize the county (Zastavna), and even specific villages (e.g., Vikno, Bridok, and Myitkiv), in Bukovyna from whence the items of traditional folk apparel as rendered in Brett's illustrations originate. It is obvious that SHE did actual research before undertaking her gorgeous -- and truly and impeccably ethnographically correct -- illustrations for her retelling of the classic Ukrainian tale "Rukavychka"/"The Mitten". "The braid that edges the piece is visible at the bottom. The color varies from village to village, from dark like this example to golden yellow/orange in the town of Kosmach. " Despite your unclear reference to the color (of what?) 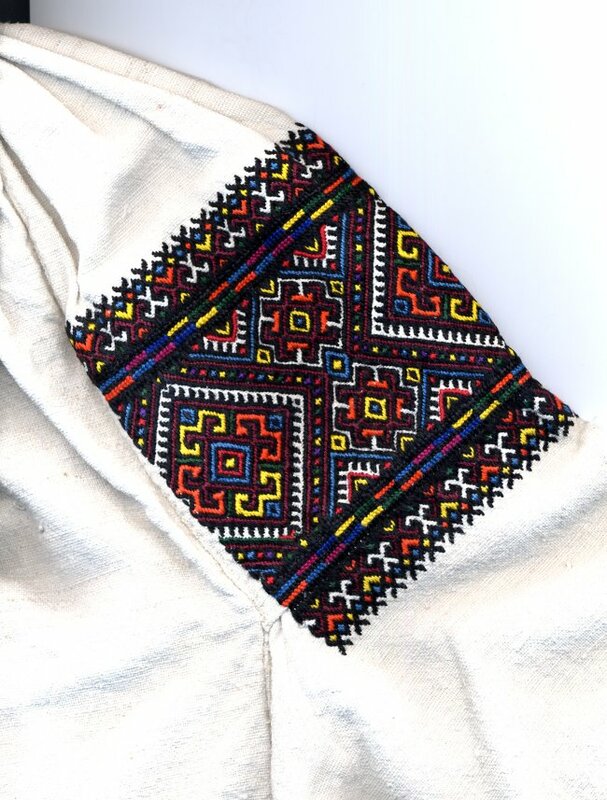 varying from village to village, your readers need to know that it's not the braid around the woven skirt-panels, but the panels themselves that were made in different colors in different areas of the Hutsul region. Let's be clear about that: The color of the braids that surround the finished skirt-panel (zapaska) does vary, but the important point here is that coloration of the zapaka(panel) itself depends on where in Hutsulia it comes from. It is the color-scheme of the woven skirt-panels themselves that differs from one area of Hutsulia to another. 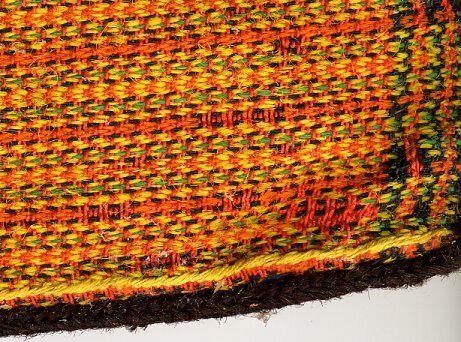 And although it is often casually said that the zapasky (skirt-panels) of Hutsulia's Kosmach area are orange in coloration, in fact this is an optical illusion caused by the skillful use of a lot of yellow bands in the basic red weaving, as well as additions of metallic gold and silver-colored threads, all of which lighten and offset the basic red threads that are the base yarn color in making Kosmach styled zapasky (panels). THat's why they look 'orange', even though there is not one thread of orange color in them! In the same way, zapasky of Verkhovyna (aka Zhabie) are called "black" because they are made with a lot of dark tones in their weft yarns, and despite the addition of silver-metallic threads in that weave, they still appear "dark" since they have no light nor bright colors in the weave. BTW - in another blog, you seemed to use the two names - Verkhovyna and Zhabie - as if they were two different places. They are the same village-town, with those names used for it at different times in its history. I took a look at what i wrote, and i see that it is unclear. Indeed i was writing about the apron panels themselves varying in color. They are notoriously hard to reproduce, because of the tiny detailed weaving that goes into them, giving them a textured look. Commercially available fabric never quite looks right. I in fact also have a Kosmach apron and i took a look at it, indeed there are no orange threads, just red and yellow with some green and black. I was going to scan a closeup of it as well, but the moths have been at it. I intend to do a posting on Kosmach embroidery, and i will include that because it is another good example of the incredible use of color in Kosmach work. ANYONE KNOW A GOOD WAY TO GET RID OF MOTHS WITHOUT THE SMELL OF MOTHBALLS?? PLEASE?!! As for Zhabie and Verkhovyno, i had the material from two different sources, and i was unaware that they referred to the same town. Im sorry that you are upset, but I stand by what i said. The very fact that the Austrians came in and taught the Ukrainians how to knit proves my point. It is not a traditional Ukrainian craft. My own reaction to reading her book was one of regret that she introduced so many foreign elements. I would expect to see a mitten cut out of sheepskin and sewn together, as i have seen in every version of the story illustrated by a Ukrainian. One example is the version told by Alin Tresselt, and Illustrated by Yaroslava. I am sure that she thought the stretchiness of the knit would contribute to the factor of the 'plausible impossible'. Most likely it did not even occur to her that Ukrainians might not make mittens in that way. It still looks to me like a western or Scandivavian Mitten. As to 'all other details being accurate' that is simply not true. She obviously did some research, one can see that. The house is correct, The clothing that Baba wears is recognisably from around Zastawna in Bukovyna, although she makes the obhortka drape in such a way that makes it clear she thought the material was much softer and thinner than it would be. There are a few Ukrainian pottery pieces on the shelves. So far, so good. Now i am relying on my memory of the book, and images online. As i recall there are also birchbark containers on the shelves, resembling nothing made in Ukraine. Then there are the little decorative details in the frames, made of birchbark, satin stitched hearts and Scandinavian style floral designs, very pretty but not Ukrainian at all. Undoubtedly she thought they were standard peasant designs used everywhere. And then there is the clothing which Nicki is wearing, with some sort of green applique design on it. I really wish she had found someone with knowledge of Ukrainian applied art to give some input. And much of it simply is not. Certainly there is such a thing as literary license, and yes, she has her own distinctive style, but still, upon reading the book, my biggest impression is that it was drawn by a non Ukrainian who tried, but didnt get all of it right.